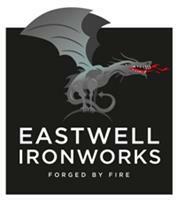 Eastwell Ironworks - Blacksmith/Ironwork based in Cinque Ports Road, Kent. Eastwell Ironworks has been established since 1997 and have a wealth of experience in the metal working industry. We are a dedicated team of English craftsmen who take great pride in our work and guarantee to meet our client's expectations. Covering Kent, London, Surrey and Sussex. For more information visit our Facebook page or website. We look forward to hearing from you.